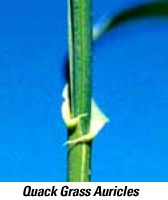 Quack grass is an undesirable, aggressive, perennial grass that grows as a weed in many lawns throughout the growing season. It forms in patches, and has a coarse fibrous root system, that spreads by long-lived rhizomes as well as by seeds. a newly germinated plant to develop rhizomes. It is very important to eliminate the plants before they reach this stage. The creeping rhizomes are so tough they can push up through asphalt pavement. If left to grow, they will form a dense mat 4″ thick in the upper part of the soil. 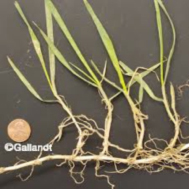 One plant can produce 300 feet of rhizomes each year. Never rototill where quack grass is growing. The rototiller will chop up the rhizomes and create thousands of new plants! One method of controlling Quack grass is to apply a non-selective herbicide that contains the active ingredient Glyphosate (Round Up). Be careful because Glyphosate kills desirable grasses as well as weeds. Apply the herbicide only on the Quack grass patches. One way to apply Glyphosate to help reduce damage to desirable grass is to mow the lawn , then wait 3-4 days, then wipe the Glyphosate onto the taller growing Quack grass with a paint brush, sponge mop, or applicator. Quack grass tends to grow quicker and taller than your desirable grasses therefore it will stand out a few days after mowing. Unfortunately there is no herbicide you can use that will not also kill the desirable lawn grasses. Is there any chemical product that will kill the quack, but not the lawn? Unfortunately the only product that will kill unwanted grasses is a non-selective herbicide such as “Round-up”. This obviously has to be used with care as it will kill all vegetation it comes in to contact with! One method you may try is putting the product on to a sponge. Try “painting” the blades of the unwanted grass with the damp sponge- again taking care not to drip excess product onto your desired grass. Once you eradicate the quack grass you will need to do corrective seeding as well to ensure other problem grasses or weeds do not take up home in the new weakened areas. Its a tedious process but with patience can work. Best of luck!